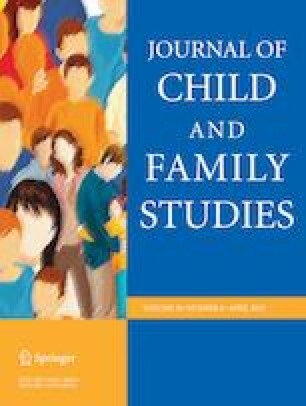 Examined the influences of parent-grandparent coparenting relationship on young children’s social competence, and the potential mediating role of maternal parenting self-efficacy between them in Chinese urban families. A two-wave longitudinal study was conducted. A total of 317 young children’s mothers participated in Wave 1, 179 of the 317 participants participated in Wave 2 six months later. Mothers completed scales of parent-grandparent coparenting relationship, maternal parenting self-efficacy, and children’s social competence in Wave 1 and reported their children’s social competence again six months later. Structural equation modeling with a bootstrap resample of 1000 indicated: (a) the cross-sectional study showed that maternal strategies efficacy (ab = .06, 95% confidence interval [CI] = [.02, .10], p = .006) and child outcome efficacy (ab = .14, 95% CI = [.01, .08], p = .002) partially mediated the effect of parent-grandparent coparenting relationship and children’s social competence. (b) the six-month follow-up study showed that child outcomes efficacy totally mediated the relationship between parent-grandparent coparenting relationship and children’s social competence (ab = .07, 95% CI = [.03, .12], p = .003). These findings highlight the contribution of the harmonious parent-grandparent coparenting relationship and maternal parenting self-efficacy to young children’s socialization and are discussed in light of family systems theory and the ecological model of coparenting. The study was supported by a grant from the National Social Science Foundation of China (Grant No. 15CSH053): Parent-grandparent coparenting in urban families and its influence on young children’s social adjustment. We wish to thank the families who volunteered for the study for their time and effort. This study was funded by National Social Science Foundation of China (Grant No. 15CSH053) to Xiaowei Li. L.X. : designed and executed the study, assisted with the data analyses, and wrote the paper. L.Y. : analyzed the data and wrote part of the results. All procedures performed in studies involving human participants were in accordance with the ethical standards of Beijing Normal University and/or national research committee and with the 1964 Helsinki declaration and its later amendments or comparable ethical standards.